Storm Shadow finally confronts Snake Eyes with his ultimate offer. High above the ground in the Temple of the Bells, scores of Arashikage archers take aim at Snake Eyes. But a drop of oil falls from the point of one of their arrows, and the G.I. Joe ninja spots it, giving him the split second notice he needs to avoid the hail of arrows and fight back against his attackers, cutting them down with a hail of bullets. Spotting more foes above him, Snake Eyes effortlessly scales the temple's structure, fighting off ninja as he goes; while elsewhere, Storm Shadow advises his followers that their only hope of defeating Snake Eyes is to hope that he tires, or for a bit of luck... though Snake Eyes has always been a lucky one. Scarlett contacts the missile cruiser HMCS Regina with a call for a fire mission to take out the B.A.T.s threatening the Joes on the ground in Nanzhao; though she's unable to tell the ship's captain which military unit she's from, he takes her coordinates... which are sorely needed, as the B.A.T.s haven't been stopped by the river, and are stil marching towards Tripwire, Beachhead and Hard Drive. Meanwhile, Roadblock and Flint are clinging to their armored car as they're swept downriver, and are almost thrown off it when the vehicle snags on some wreckage; but they soon realise they have bigger problems, as the top half of the B.A.T. that Roadblock blew apart with a TOW missile is still active and clinging onto the car! ...accepts, taking his fellow ninja's hand. On Scarlett's orders, the Regina launches its payload of four Harpoon missiles at the site on the Rhozho river. The three Joes that were holding off their foes turn to run from the impact site, but all three are knocked down by the B.A.T.s' miniguns hitting their body armor; they've made it out of the way, however, and all three B.A.T.s are blown to smithereens by the missiles. Meanwhile, a massive wave throws Flint, Roadblock and the remaining B.A.T. from the jeep and into the river, where the android is destroyed; much to the consternation of Destro, who had assured Cobra Commander that the androids would be able to stay behind as an occupation force. Calling Destro to express his annoyance, the Commander nonetheless takes their destruction in stride, merely having M.A.R.S. Industries shoulder part of the cost of the robots. Though Team Alpha have survived the B.A.T. attack, and Flint and Roadblock have been pulled out of the river, it's hardly a win for the Joes: with a whole country destroyed, thirty million refugees and the world scared into recognising Cobra, there's little more to do now than count their losses. Outside the temple, Helix takes aim at Snake Eyes, certain that she can kill him, as she never misses. She tries to get him to stop and come back with her, but the ninja silently walks past her into the jungle; and despite her bravado, Helix cannot bring herself to shoot. "You are easy to follow, my brother. Everywhere you leave a trail of the dead. I once feared that the path you chose would make you weak. That becoming a soldier for the spoiled and self-indulgent Americans would pollute your spirit. I am pleased to see that I am wrong. You deal death as brutally and elegantly as I remember." "We need some punch, captain. Bunker buster strength." "Will four Harpoons do, miss?" "It will, sir. And might I add — you Canadians sure are a polite bunch." On page 17, panel 3 (the conversation between Scarlett and the captain of the Regina) attributes the speech bubbles to the wrong characters. 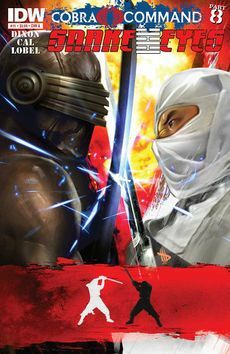 Cover A: Snake Eyes vs Storm Shadow, by Dave Wilkins. Cover B: Storm Shadow and the Arashikage leap in, by Robert Atkins and Simon Gough. Cover RI: Storm Shadow and Snake Eyes duel behind Cobra Commander's head, by David Williams and Kelsey Shannon; combines with the RI covers to Cobra Command, Part 7 and Cobra Command, Part 9 to form a complete image. This page was last edited on 11 October 2017, at 15:22.